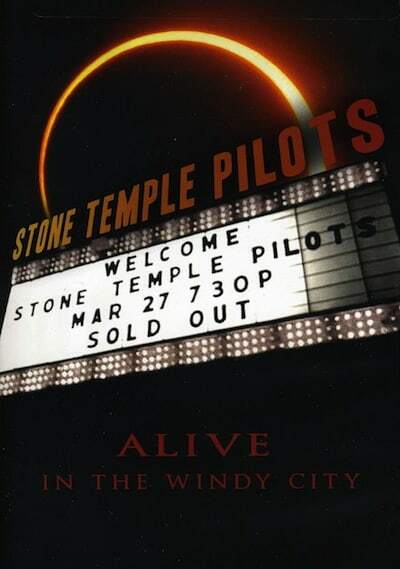 The Stone Temple Pilots’ ‘Alive In The Windy City’ DVD is a full on energetic outpouring of rock ‘n’ roll awesomness! It was filmed in the Riviera Theatre in Chicago back in March 2010 and tied in with the release of their self-titled album. it intersperses such songs from that album as ‘Between The Lines’, ‘Huckleberry Crumble’ and ‘Hickory Dichotomy’ with some classic hits like ‘Vasoline’, ‘Big Empty’, ‘Plush’, ‘Sour Girl’ and ‘Interstate Love Song’. It works very much like one long visual album; there aren’t any audience reactions or cheering, but we think the show benefits from this leading us from song to song with quick editing and a frenetic pace. The filming is impeccable and the sound is crisp, it really keeps in with their original albums. Scott [Weiland]’s voice is still strong, at times strained but considering he’s in his forties and has a checkered past with addiction it’s great to see him back on form and rocking out like and old-school pro which is incredibly satisfying. The rest of the band consisting of Robert DeLeo on bass who we get to hear his backing vocals, Dean DeLeo rocking the guitars, and Eric Kretz beating the drums are on a high throughout, the play fast and enthusiastically never once losing their edge. This combined with some crazy lighting and incredible backdrops (images of fire and trippy colours swirling on a projection screen behind them in time with the tunes) it keeps your attention the whole time and makes you want to rock out in your living room. There’s also a really good interview with the band included on the DVD, which possibly says more about them than the gig itself; Scott is quite rock-and-roll-pretentious giving one word answers in his shades but the rest of the band are pretty jovial, joking around ribbing each other, it shows they’ve matured since their grungy days but still love what they do. The interview asks some decent questions about the conception of the album and their ideas and gives a small insight into how they work as artists, a nice addition for the fans. Overall the DVD is great; feels a little short but coming in at just over an hour and a quarter you really lose track of time. The band are all back in top form and some of their greatest songs are played at their best. One for the collection? Oh definitely. 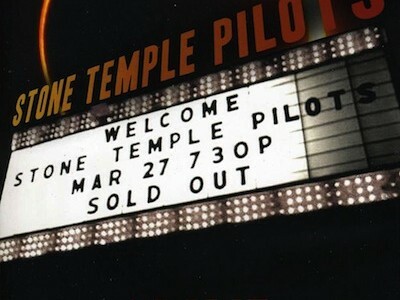 For more information visit the official Stone Temple Pilots website. Jay is, above all things, a massive movie nerd with an overly intense love of art, illustration and film making in general. He functions as Artistic Director of Media Agency the Creative Condition and can be often found writing film and DVD reviews, running burlesque life drawing classes and scribbling and sculpting away with exuberant satisfaction.